Before commencing its large-scale renovations, Museum Boijmans Van Beuningen pulls out all the stops with the exhibition ‘netherlands ⇄ bauhaus – pioneers of a new world’. 2019 is the centenary of the founding of the Bauhaus, the revolutionary art and design school whose influence can still be felt today. Almost 800 objects – artworks, furniture, ceramics, textiles, photographs, typography and architectural drawings – provide a unique insight into the inspirational interactions between the Netherlands and the Bauhaus. Envisaging a new world and a quest for simplicity and functionality were among the principles of the Bauhaus. Walter Gropius established the revolutionary school for artists, architects and industrial designers in the German city of Weimar in 1919. In a period in which only a small elite could afford products designed by artists, the Bauhaus worked from the ideal of making beautiful and functional design available to all. The school’s groundbreaking ideas, which later exerted worldwide influence, found their echo in the Netherlands in architecture, design and education. Museum Boijmans Van Beuningen explores this Netherlands ⇄ Bauhaus network for the first time in a major survey. The Bauhaus teaching staff included famous artists such as Wassily Kandinsky, Paul Klee, László Moholy-Nagy and Oskar Schlemmer. Various Dutch artists also contributed to the school’s specific character. Even before the establishment of the Bauhaus, H.P. Berlage, Mathieu Lauweriks and Johan Thorn Prikker were members of the Deutsche Werkbund (established in 1907), whose ideas about the fusion of art and industry were an important source of inspiration for the Bauhaus. De Stijl, the magazine of Theo van Doesburg, Piet Mondrian, Gerrit Rietveld, J.J.P Oud, among others, was read by all the teachers and students at the Bauhaus. Under the influence of these artists, the Bauhaus quickly abandoned its Expressionist roots in favour of a Functionalist approach. The school was forced to move twice – to Dessau in 1925 and to Berlin in 1932 – and was finally closed by the Nazis in 1933. Some thirty teachers and students fled to the Netherlands, where they established businesses, designed for Dutch industry and were active in art and design education. J.J.P. Oud, Rotterdam’s Municipal Housing Architect, was an important link between the Bauhaus and Rotterdam. His social housing projects in Spangen, the Kiefhoek and the Witte Dorp (White Village) attracted the attention of German architect. 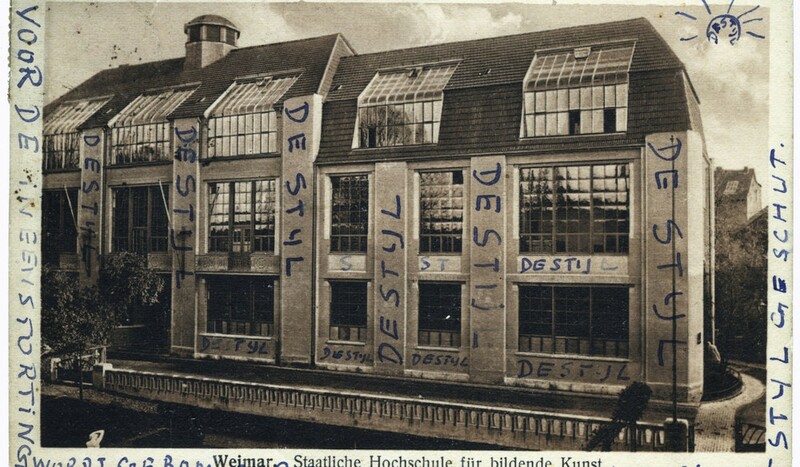 Oud gave an important lecture on Dutch architecture at the Bauhaus in Weimar in 1923. This was the beginning of regular contact between the German school and Rotterdam, and Dutch Functionalist architecture soon gained international recognition.